Service providers will be on this list only if I or people whom I know have had good experience with them. I would feel bad recommending someone and then hearing that they were not satisfactory. Nonetheless it can happen, let the buyer be wary. Ask questions, look for other references, but I'm tellin' ya these people are good, I'm picky. Telephone numbers without area codes are within the 619 area. 619 871 5927 Residential landscape consultation, design, installation, with emphasis on today's water conservation concerns, drought tolerance, native plantings, irrigation, lighting, terra-sculpting, water features, hardscape, comprehensive property design. Honest, ethical, loads of references. 286-3417 Emily is really nice to deal with, gets it done on time and very reasonably. 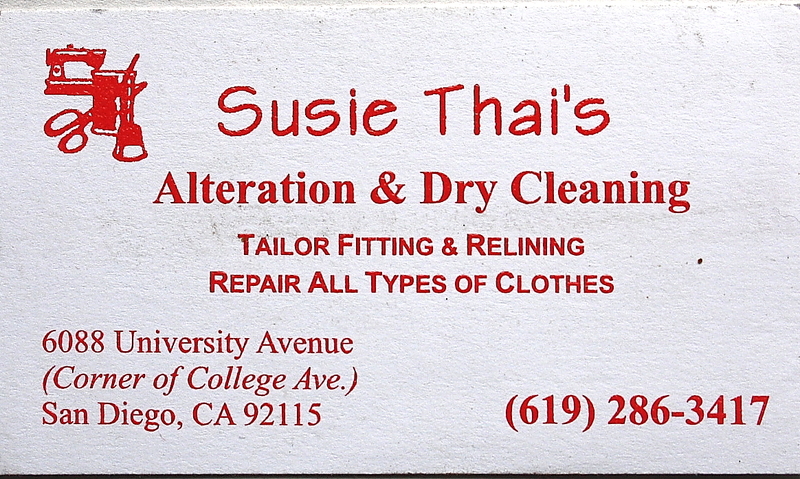 I go there for all and any alterations or repairs. Full four-star recommendation. La Mesa, Ca. 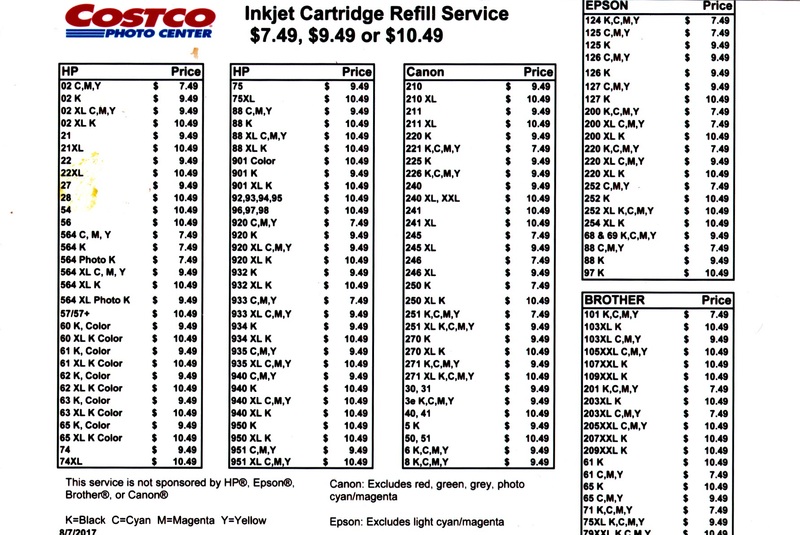 Costco refills some of the common ones but not aftermarket cartridges, just the machine brand name pieces such as Canon, HP, Brother, etc.This list is a few years old so they may service more modern cartridges as well, check with them about yours. Click the picture to see the list. 619 462 8229 Knowledgable, mega-experienced, really nice, really reasonable. No general plumbing, just drain clearing/de-clogging. Russell Plumbing and Supplies, Inc.
561-0585, 561-1611 I've worked with Josh, Wade and Dave; nice people, professional and really competent. State Contractor #300834 Specializing in water heaters, knows his stuff, his son runs the company for general plumbing work. 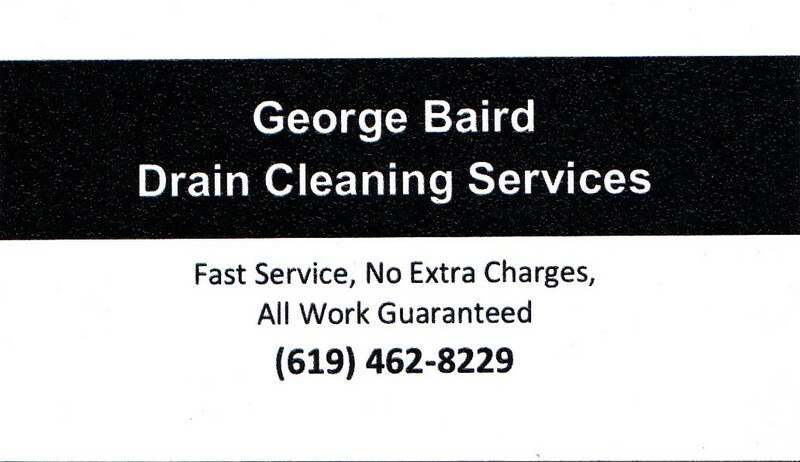 Business 447 6467, cell 726 7456 Good company, reasonable, good work, conscientious about any follow-up or afterwork. Talk to Steve himself if you can, he's super straight forward and knowledgable. rifka@san.rr.com Replaced a porch light fixture with plastering, did sterling job. Super nice, civilized people, they're the bomb. Don't know about how much they charge but I'd call 'em, the whole experience was really good. vallejoelectric@gmail.com Licensed, insured, Rick did a Request for Repairs punchlist job for me on one of my listings, knocked it out quick and easy. He does those all the time. Answers his phone, that's big on my list. 460 8086 Good work, nice people, I like 'em. 582 2299 OK, my cousin told me about these guys. They're some sort of senior organization and they'll come to your house and they pick your fruit trees and distribute it to those who could use it. She said that they sometimes take a while to call you back but if you're not using all those lemons, limes, oranges, grapefruits, avocados, tangerines, grapes, tomatoes or whatever then it would be a nice conscientious thing to do. 280 0331 Need tires for your car? This place does a fine job, the staff are nice, no one tries to sell you something that you don't need or want, very reasonable prices, prompt service. Make sure to visit the koi pond in the customer patio. Honest, quality work and service. 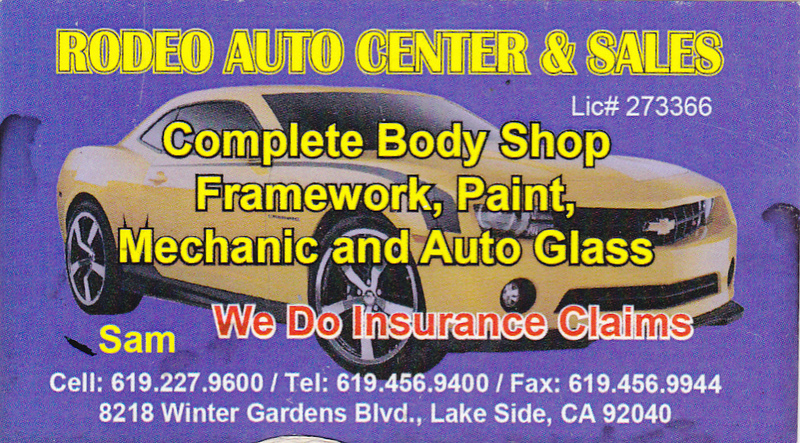 619 227 9600 Bodywork, paint, mechanical, call Sam, the owner, he runs the show. Super nice, honest, super reasonable, keeps commitments. 447 0025 Classic british car specialist; Triumph, Austin Healey, Morris, Mini, MG. Currently rebuilding my Triumph 2000 cyinder head. 4642 College Ave. at Adams, behind the cafe on the corner. 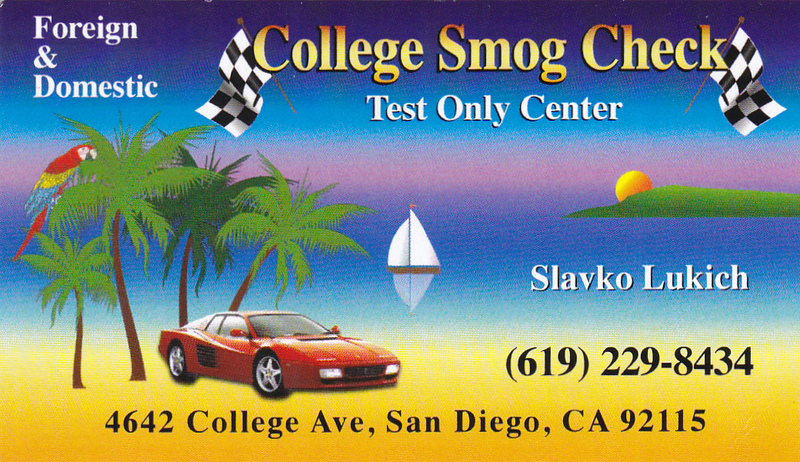 229 8434 Just smog checks, that's all they do there. Very reasonable, honest, helpful, one-man show, speedy, a pleasure to do business with. Make sure your renewal calls for a TEST ONLY test place. Used to be on Adams but they lost their location there. Good business, service, people. 286 8501 Humphrey's specializes in seconds/blemishes, returns or excess inventory. I've had more than one client or contact tell me that they got the best deals on appliances there. The staff are real nice and they'll get you what you want. Straightforward people. Ben Benchekroun 947 9721 Doesn't work on built-ins,but ref'gs, stoves, wash/dryer, those sorts of things,full experience-based AAAA rating, call him. 562 7771 $45.00 visit fee, then service charges. No installs. 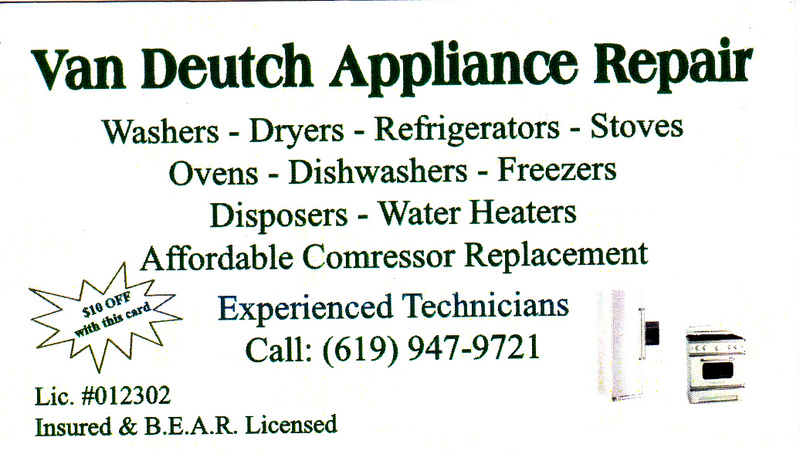 If you need your appliances repaired, call them. Steve is great. If you need parts for your appliances, call them. 8772 La Mesa Blvd., La Mesa, Ca. 619 463 7755 They will provide flooring to sellers, to be paid for from escrow proceeds. 401 0700 Take your good used furnishings which you want to sell. If you need help getting them there then call Craig at 581 4409. He comes and writes the deal up right then and there and then takes the things down there for you. edwardsbuildingrepair@cox.net J.B. Edwards is the guy for any glass, door, or window needs, has older obscure parts, knows how to fix old out-of-date set-ups. "Reasonable, gets out spots that other people couldn't. I call them all the time because they're so reasonable, I have beige carpet and a big dog." rsolutiontc@sbcglobal.net Termite inspect., treatment, related repairs. 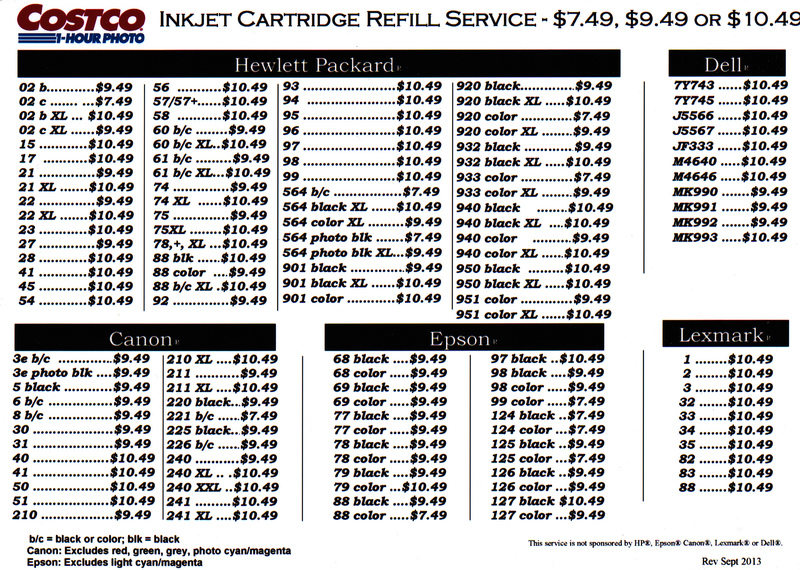 Very good service, very reasonable pricing. Meets commitments, good work, good to deal with all the way around, full recommendation. 561 1991 Good service, good to deal with, meets commitments. 806 0538 haven't used yet, referred by Johnnie West Elec. My co-agent Harriet's plumbing pics! she knows her service providers.